A twist on a classic tagine, using fresh fruits instead of dried. The minted quinoa is simple yet delicious, and a perfect companion to this easy dish. In a large saucepan, heat oil over medium heat. Add onions, and sauté until translucent, about 5 minutes. Add spices, stirring frequently, about 1 minute, until fragrant. Add a splash of water if it is getting a little dry, then stir in garlic, ginger, and lemon mixing well until very aromatic, about another minute. Reduce heat and add cauliflower then cover, letting cook about 8 minutes until softened. Add blueberries, apricots, tomatoes, and chickpeas. Stir to mix. Cover and cook for about 3 more minutes. Remove lid and add tomato paste, stirring until well-blended. Let cook, uncovered until thickened, about 5 minutes. Set aside while preparing quinoa. For the quinoa, cook according to package directions. After it is finished, remove the lid, and fluff with a fork. Mix in the mint and squeeze with lemon juice, adding salt to taste. Cover, and let stand another five minutes. 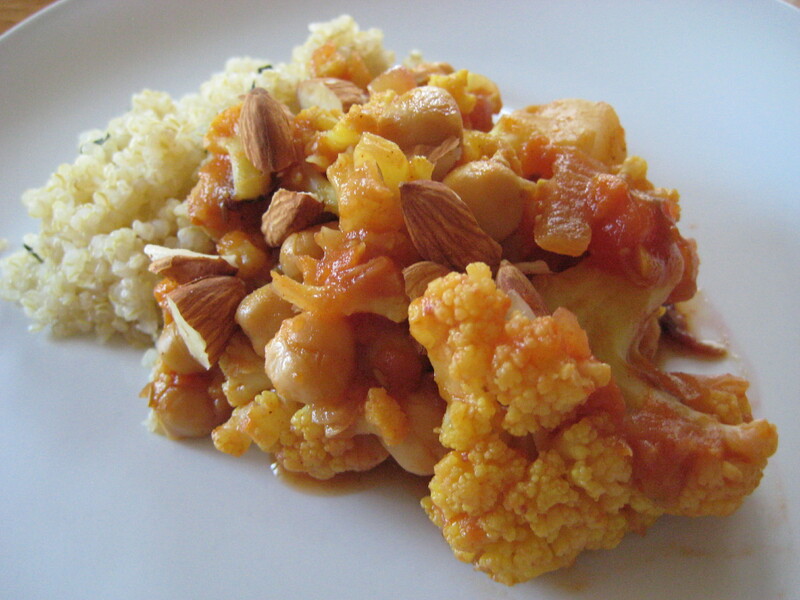 Serve tagine atop the quinoa, and garnish with the almonds.